Multicultural Children's Book Day is celebrating diversity in children's literature and the importance of shortening the 30 million word gap. Studies show that children are motivated to read more books when they see themselves on the page. Our mission is to not only raise awareness for the kid’s books that celebrate diversity, but to get more of these books into classrooms and libraries. Children’s reading and play advocates Valarie Budayr from Jump Into a Book and Mia Wenjen from Pragmatic Mom have teamed up to create an ambitious (and much needed) national event. 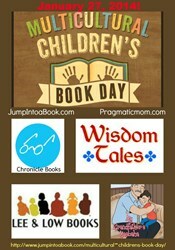 On January 27th, 2014 Jump into a Book and Pragmatic Mom will be presenting the first ever Multicultural Children’s Book Day as a way to draw attention and raise awareness about diversity in children’s literature. Despite census data that shows 37% of the US population consists of people of color, only 10% of children’s books published have diversity content. Using the Multicultural Children’s Book Day, Wenjen and Budayr, along with event sponsors Wisdom Tales Press, Chronicle Books Susan Daniel Fayad: Author of My Grandfather’s Masbaha and Lee & Low Books are on a mission to change all of that. Their goal is to not only raise awareness for the kid’s books that celebrate diversity, but to get more of these types of books into classrooms and libraries. Another goal of this exciting event is create a compilation of books and favorite reads that will provide not only a new reading list for the winter, but also a way to expose multicultural books to families, teachers, and libraries. Budayr, a best-selling children’s author of The Fox Diaries: The Year the Foxes Came to our Garden and The Ultimate Guide To Charlie and The Chocolate Factory, is passionate about making kid’s books come alive and is proud to be a play and reading advocate. Budayr’s mission is to inspire children and families to embrace their world through reading, play and creativity. Wenjen is a Harvard grad with a love of children’s books and prides herself on her ability to sneak in teachable moments in art, science, math, foreign language and language arts. Wenjen is passionate about getting kids excited about reading and helping parents ensure that their child is successful at school. Multicultural Children’s Book Day will include book reviews from noted bloggers all over the world, giveaways and book-related activities for young readers of all ages. For media interviews please contact project manager Rebecca Flansburg at Becky(at)AudreyPress(dot)com.